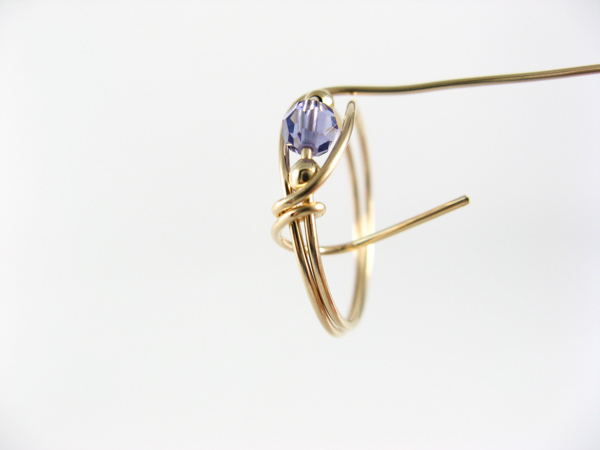 This free tanzanite wire ring project is a great way to learn how to make wire bead rings. 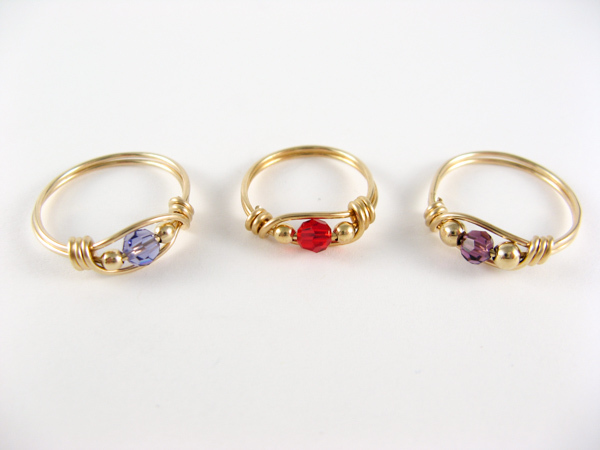 After you've made a dozen or so of these rings, you will feel more comfortable working with wire. They don't all turn out the same, so don't get upset if your first attempts are not perfect. Make one for each of your friends. 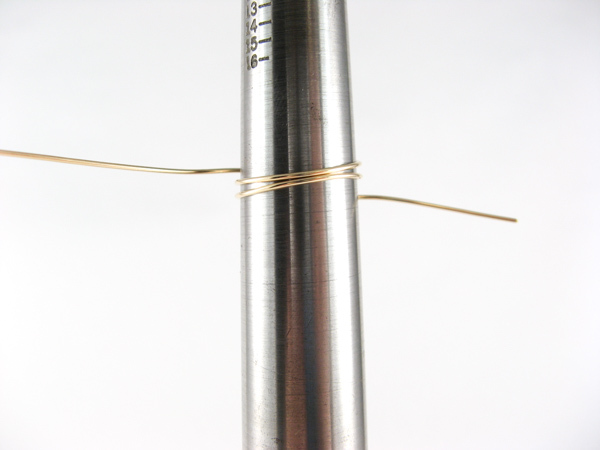 Step 1: Pull your 8" length of 20 gauge round dead soft gold filled wire through a sunshine polishing cloth a couple of times to straighten your wire. Some people like to use a nylon jaw pliers, but I prefer the polishing cloth because it cleans the oil residue off the wire. 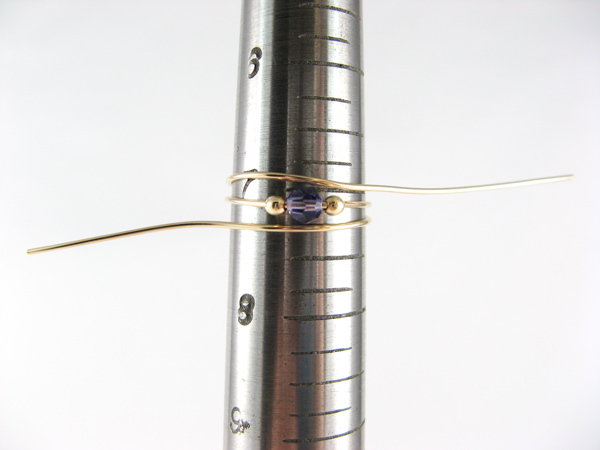 Step 2: String one 2mm round gold filled bead, one 4mm round tanzanite crystal, and one 2mm round gold filled bead onto the center of your wire. If you can't get the wire through the crystal bead just try another crystal. Sometimes the crystals don't slide easily onto the wire. 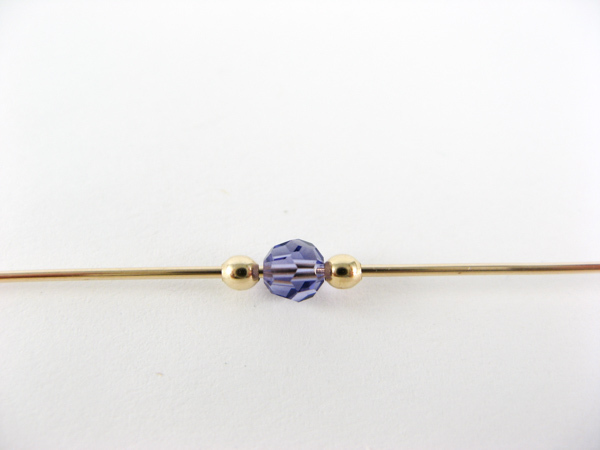 You don't want to force the crystal bead onto the wire because it will crack. Step 3: To make a size 6-1/2 start on the size 7 of your ring mandrel. 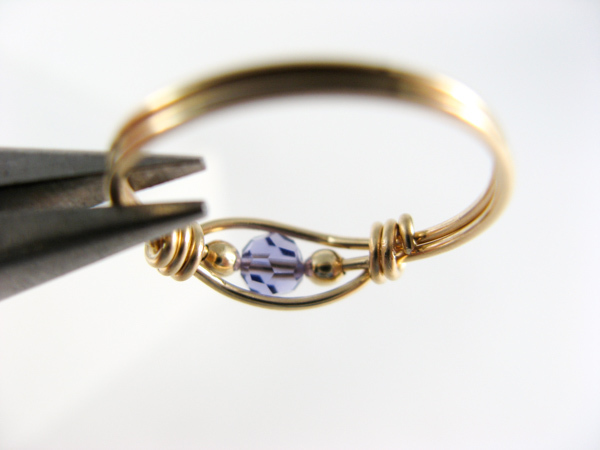 Hold the beads down with your thumb as you wrap the wire around the ring mandrel. Step 3b: This is a view of the back of the ring mandrel. You can cross the left wire over the right wire or visa versa. After you have made a few of these bead rings you may find you prefer one direction to the other. Step 4: Bend the wire as shown. Your wire may be a little different depending on which way you crossed the wires in step 3. It doesn't matter. 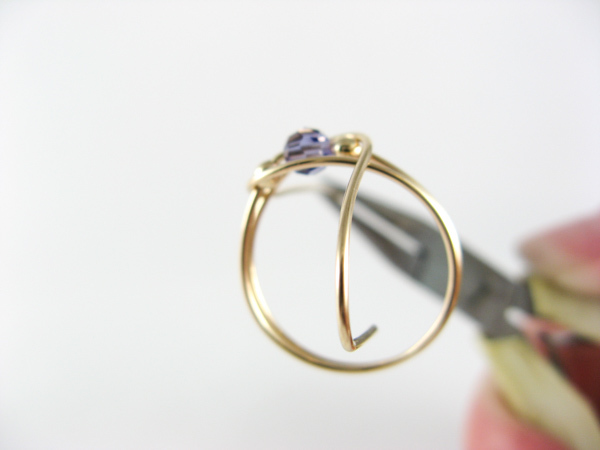 Step 5: Remove your bead ring from the ring mandrel and bend the end of your wrap wire so that you can tuck it through the center of the ring. 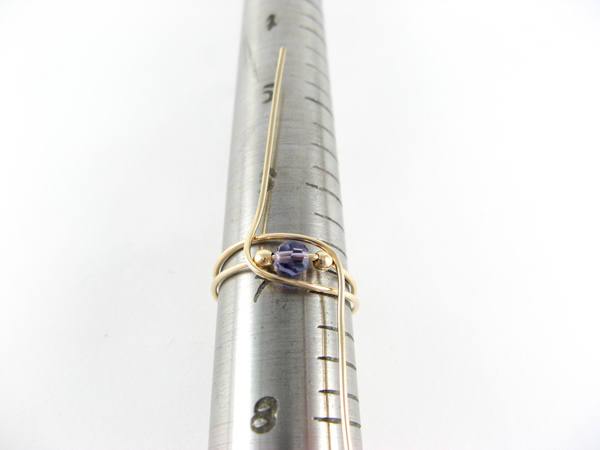 Step 6: Wrap the wire around the ring shank three times. I use my chain nose pliers to pull it tight. 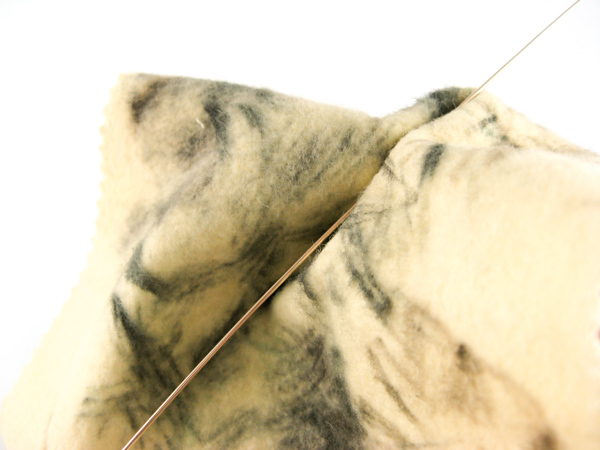 Then I gently squeeze my wraps down and make sure they are snug together. Step 7: Snip the end of your wrap wire with your flush cutters and use your chain nose pliers to tuck the wire end into the ring shank. You may want to file the end of the wire before tucking it. You don't want any sharp ends scratching or cutting the person wearing the ring. If your ring is a little out of round just put it back onto the ring mandrel and tap it gently with a rawhide hammer. Be careful with the crystal beads, they crack easily. 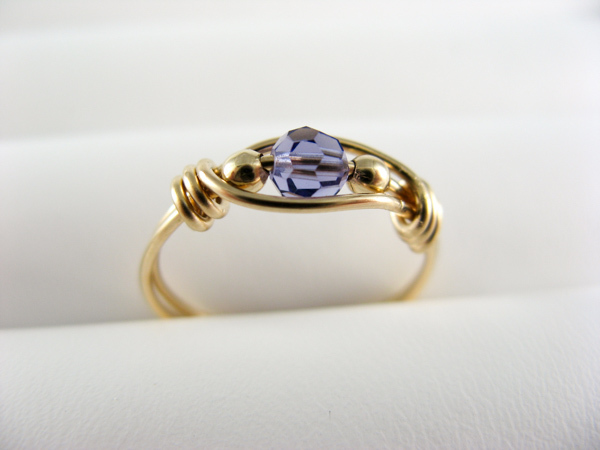 The ring on the right with the amethyst bead was made with 3mm gold filled beads. You can make these fun little rings with whatever beads you want. You might want to try glass E beads, they fit onto 20 gauge wire easily.